Wellness workshops are drop in format, no appointment needed! Registration is encouraged for “Express Your Stress”. All Wellness Workshops are held in the Wellness Center, Nordenberg Hall unless otherwise stated. All Workshops are 45 min-1 hour in length. CLICK HERE to go to Workshop Sign-Up. The Anxiety Management 101 Workshop is a series of 4 classes. The purpose is to teach skills for managing the physiological symptoms of anxiety, challenging anxious thoughts, and coping with test anxiety. Students are not expected to share personal information, talk about their experiences of anxiety, or even share their name with other students in the room. If what you’ve tried thus far hasn’t worked or you would like to learn new skills, it might be beneficial to give this workshop a try. In this three-week workshop series, find out how to assess your unique strengths and skills, and harness them to persevere through the unique challenges facing students like you. Join us at the University Counseling Center to learn how to face your feelings and work through the tough stuff, so you can get back to living your best life. Do you notice you struggle with focusing, procrastinating, and following through with goals and plans? If so, this four part series is the workshop for you. Topics will include specific strategies to increase attention, boost productivity, and practice better self-care and holistic health habits. 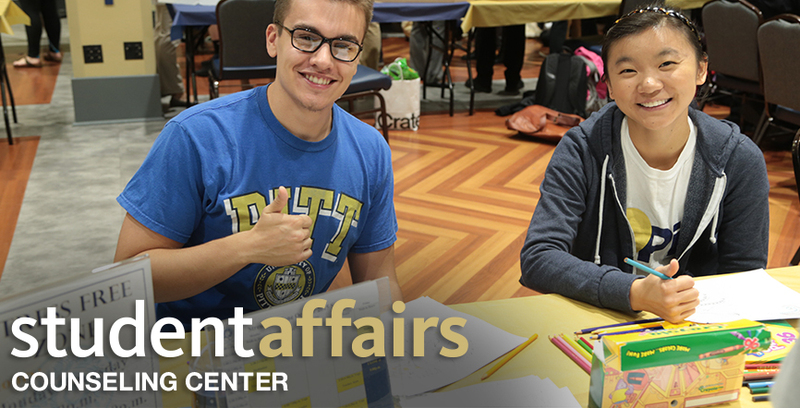 Please visit https://www.creative.pitt.edu/our-programs for more information. The Coping with Financial Stress Workshop aims to help students navigate their finances in a way that supports their overall well-being. We will provide students with referrals to various tools and resources that can help them increase their financial knowledge and skills. Students will be provided with the educational strategies to cope with economic stressors and to make informed decisions surrounding their finances during their time in school and beyond. Come learn about qualities of healthy relationships and strategies for building them with friends, family members, classmates, and partners. Offered around midterm and finals time focused on understanding the effects of stress around exams and learning effective coping strategies to manage it better. The goal is to help provide students skills to help regulate emotions, tolerate stress, work on interpersonal skills and learn about goal setting. #2 Feb 1 What is mindfulness and what is it all about? As the late, great Audre Lorde said, “caring for myself is not self-indulgence, it is self-preservation…” College is hard enough on its own. Adding micro-aggressions and invalidating experiences into the mix can make life miserable. Join us at the CCLD each week for an hour of reflection and resistance. Connect with like-minded peers as we discuss how to navigate challenging campus, community, national, and global cultures; & how we can take care of our physical, mental, and emotional selves when our environment is disaffirming. Have you been seeking happiness but just can’t seem to find it? If so, this workshop is for you! In this workshop, members will learn skills designed to help them embrace their lives more fully and experience the happiness they’re seeking. Happiness is all around us, sometimes we just have to look for it! So let us help you find it. Topics include strengths, forgiveness, gratitude, hope and optimism, meaning and purpose, positive relationships, and positive communication.